For the ultimate in eye candy courtesy of Mother Nature, this Iceland tour with northern lights is a must-go. 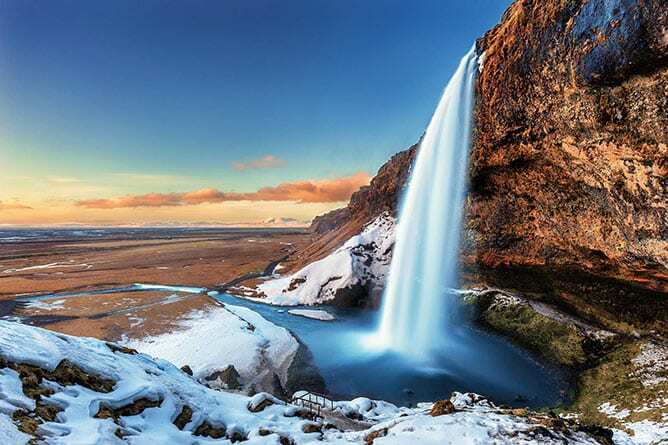 Our journey through “The Land of Fire and Ice” loops from the capital Reykjavik, one of the world’s cleanest, greenest cities, past towering waterfalls and dramatic glaciers to the black-sand beaches of the remote village Vik. And, if the weather gods are smiling, you’ll also gaze at the wondrous spectacle of the aurora borealis (aka the northern lights). It’s hard to top the visual delights of Iceland’s epic terrain, but you’re sure to treasure the country’s fascinating heritage, rich literary and creative traditions, and local food on this rare adventure. *Note: Sighting cannot be guaranteed, and the scheduled excursion from Reykjavik might be rescheduled locally due to weather conditions in order to maximize the chances of seeing the northern lights. You will also have an excellent opportunity in the remote Vik area in the countryside of South Iceland to see them. **Note: Icelandair does not provide meal service on this flight. Your tour includes airfare from the U.S. You’ll take a nonstop overnight flight to Reykjavik on Icelandair. You’ll want to eat dinner prior to departure or be prepared to purchase a meal en route since Icelandair does not provide meal service on this flight. Also, as the flight is short, try to sleep as much as possible while in the air to avoid jet lag. Note: Northern Lights sightings cannot be guaranteed, and the scheduled excursion from Reykjavik might be rescheduled locally due to weather conditions in order to maximize the chances of seeing the Northern Lights. You will also have an excellent opportunity in the remote Vik area in the countryside of South Iceland to see them! Single room supplement is $429. Reservations for your tour to Iceland can be made by phone (1-800-337-7773) and will be confirmed upon receipt of $300 per person non-refundable, non-transferable deposit which must be received within 48 hours of reservation. Full payment is due 75 days prior to departure. Baggage fees may apply. Space and prices subject to availability. For your Iceland vacation complete booking information and terms & conditions click here. Optional tours help make your visit to Iceland even more memorable. Please note that not all tours will be available on all departure dates. Pay in cash (USD or local). You may also pay with credit card, which may result in service charges. All rates are approximate and subject to change based on fluctuation of exchange rates and supplier rates. Optional tours are nonrefundable. Join a fascinating full-day optional excursion to the spectacular Snaefellsnes peninsula, where you’ll see white- and black-sand beaches, bird cliffs, spectacular mountains, volcanic craters and charming fishing villages. The area has attracted global attention and has been the filming location for Journey to the Center of the Earth and the recent version of The Secret Life of Walter Mitty. Experience Icelandic nature on a glacier walk at Solheimajokull glacier. On the two-hour drive from Reykjavik, you’ll pass under the famous Eyjafjallajokull volcano. Just east of the volcano lies Solheimajokull, an outlet glacier from Myrdalsjokull, Iceland’s fourth largest glacier, where you’ll take a safe, easy walk up onto the ice field. As we explore the wonderland of ice sculptures, ridges, and deep crevasses, you will learn more about these disappearing giants. Our experienced mountain guides will teach you how to use basic glacier equipment necessary for this tour. On the way back, we’ll stop at the picturesque waterfalls, Skogafoss and Seljalandsfoss. Explore the hidden underground system of lava caves on this guided tour. Equipped with lights and caving gear, you’ll enjoy the display of colors, shapes and textures, while the guide tells stories of trolls, elves and outlaws. Untouched for thousands of years, lava tube caves are underfoot in the vast ancient lava fields that cover much of Iceland. This tour is a rare combination of adventure and serenity, all in an otherworldly place! Located in the main square, this hotel features comfortable rooms with free WiFi and a top-floor bar/restaurant commanding city and harbor views. Countryside hotel set amidst mountains, black-sand beach and the Myrdalsjokull Glacier. Access to relaxing outdoor geothermal hot tub. Iceland is one of the most spectacular destinations on earth, yet the tourism infrastructure remains underdeveloped relative to other European destinations and typical American standards. In particular, the hotels in Iceland are much more basic in their amenities and typically have smaller rooms. That said, smarTours has planned an exciting, breathtaking trip to Iceland with clean, comfortable and centrally located hotels to help you enjoy your stay! Flights are on Icelandair on the following schedules. Please make sure to allow sufficient time for clearing customs and immigration if you are planning a connecting flight. We recommend at least three-and-a-half hours. Please note that flight schedules are subject to change without prior notice. Icelandair does not assign seats in advance, and smarTours is not involved in seat assignments. Seat assignments can only be arranged at the airport upon check-in. Main Tour: Land-only services start with your independent check-in at your hotel in Reykjavik on Day 2 of the itinerary listed on our tour page. Land-only services end after the guided tour of the Harpa Concert Hall on Day 7 of the itinerary listed on our tour page. 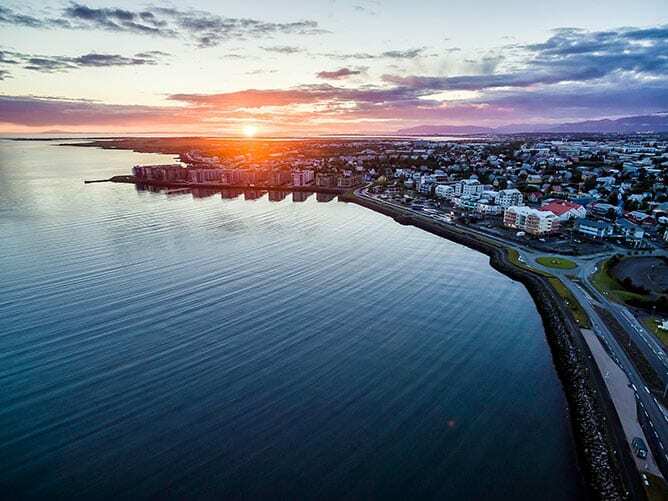 If you wish to join the welcome breakfast and orientation briefing followed by a panoramic Reykjavik city tour, we recommend that you make your own arrangements to arrive at the Restaurant Vitinn (address: Vitatorg 7, 245 Sandgeroi, tel: (+354 423 7755) by 7:45 am on Day 2. You must possess a passport valid for at least 6 months after the date of travel. U.S. citizens do not require visas. Non-U.S. citizens should check with the respective consulates for current visa requirements. Please remember that it is your responsibility to obtain the necessary travel documents before the trip. During the winter months, temperatures range from the mid-20s to the mid-30s. In the spring and fall, expect temperatures from 30-50 degrees. Daylight hours vary greatly depending on the time of year, with 9-13 hours of daylight in September, October and March, and 4-7 hours of daylight November through February. Your smarTours guide will be happy to offer suggestions for restaurants for non-included meals. The average cost for dinner (excluding drinks) in a restaurant is about $40-$80 per meal per person. Your hotel will accept credit cards for your non-included meals. Hotels and most stores accept major credit cards. However, for “street shopping” you will need local currency (some markets may accept U.S. Dollars). Your hotels will also be able to exchange cash to local currency. It is recommended that you bring along cash in small denominations. The Northern Lights Iceland Tour was fabulous!! Iceland is a magical place and our tour guide,Oli, captured Iceland’s essence for us in his tales of the Sagas and infamous Hidden People...entertaining us as we traveled from Reykjavik to Vik, seeing the stunning waterfalls and the black sand beaches, geological wonders and Nordic historical sites. Such a great trip. Thanks smarTours! We recently returned from ICELAND with our first trip with smarTours. Everything far exceeded our expectations. Our airfare was included and we flew on ICELANDAIR which was incredible. Our guide Oli was with us every step of the way and was very helpful and knowledgeable. Chosen hotels and meals represented local culture. Our only recurring question: how can Smartours give so much while costing so little?.. We are in the process of planning our next trip and would recommend smarTours without reservation! I just returned from Iceland and Chasing the Northern Lights tour. It was a fabulous trip, our guide was wonderful and very knowledgeable. Our drivers were great in getting us to our planned sites safely. The accommodations weren’t plush but certainly adequate and clean. The meals planned were delicious with plenty of fresh fish. This was my first time with smarTours, but it won’t be my last! Over all a good tour. Smartours should host the northern lights tours each night instead of only the first three nights. It is sold as the northern lights tour, accordingly, the tour should include every opportunity to see the northern lights. We had to pay extra $60/person to see the lights. The guide, Guony, was excellent!!! Thanks Guony. We were on the "Incredible Iceland and Northern Light Tour." We were not pleased to have to pay for our own Northern Lights tour with Grey Lines at an additional cost. We were told Smartours only covered the cost of the Northern Lights tour for the first three days, when we did not go out, due to snowing conditions. This extra cost makes no sense on a tour titled Northern Lights. Also, before the tour we emailed to get additional information as new travelers to Smartours and our email was not answered. On our phone contact, one representative was snippy in her attitude. The guide was very friendly and accommodating. The tour was well organized. It’s unfortunate that we couldn’t see the Northern lights. We were on the middle October 2017 tour. Our tour guide, Oli, MADE us stay out on the tour the first night that we were there--for some of us having stayed up for nearly 24 hours--BUT--he was right we had views of the Northern Lights that never appeared another night--He was great--I loved all the tales of the Trolls and Hidden People--he was very informed about all the things that make Iceland so special. Plan to go back. The worst part of the whole trip was my getting called out--cataracts and all--for extra scrutiny at the Reyjavik airport--and that the overnight at JFK was unbearable--except for watching some Peruvians in native costume--recognized from our trip to Macchu Picchu --who were waiting on a flight.--Hated that part of it all--the connection--but loved the trip itself.